This odd romance was kindled by a lame horse and a broken finger (unrelated incidents) and has, over time, roared into a consuming passion, driving me to buy each and every newest, greatest, rub-on-promise of instant healing that comes my way. Yes! Relief! Goodbye ultrasound vet bills! This one is THE one – I just know it! Sigh. Alas, there is no miracle cure for most injuries (unless you include time in the equation – that’s truly the cure). But I must say that in trying every quick fix on my guy’s old, half-healed-before-even-lame tendon lesion, I’ve uncovered small secret weapon. A “truther” if you will, that confirms or cries foul the myriad claims of these concoctions. I give you… my finger! Actually it’s the ring finger on my right hand — so don’t be offended. This unfortunate digit is my sole chronic injury resulting from multiple falls, a few stops, and a hand-grazing spook. I’m certainly lucky that this is the extent of my daily pain — but this poor finger. I don’t know what it did to deserve this! The rest of my body gets a glancing blow and that finger, sad fellow, takes the brunt, bending in ways no finger should. It’s been broken at the joint three times and received sprains to numerous to count. There’s no need to set it, I don’t even go to the doctor anymore. I keep a finger brace and first aid tape in my trunk and my husband questions nothing when I stir the pot left-handed. So, finger in hand (teehee), I test every new liniment love in a simple way – by ditching the recommended gloves when applying on my uncommunicative beast. My finger is my tell-all, loosening up, bending a bit more, pounding a bit less — or not. Ten, fifteen minutes later, it lets me know if there is the slightest hope, the tiniest whisper that wiping goo all over a hairy fetlock is worth the effort. And you know? I’ve found several that just might be worthy of a second date. Sore No More – Love this! I keep a bottle at home, too. 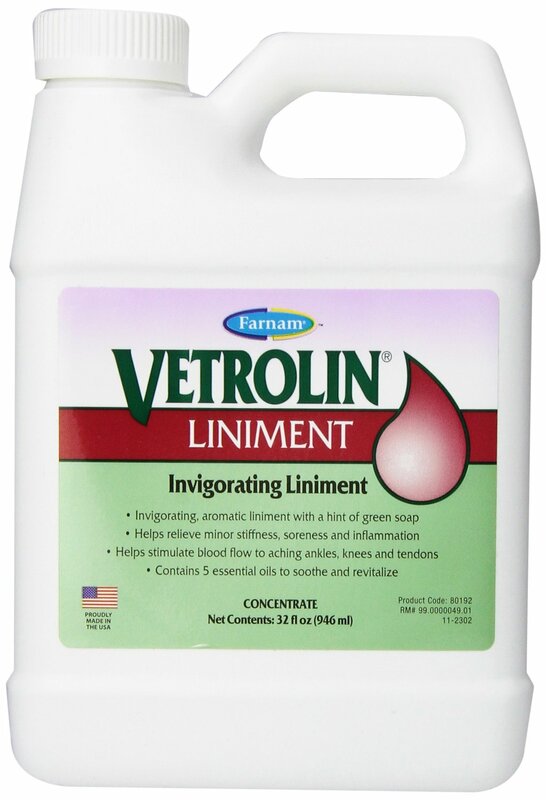 This liniment doesn’t have the heat and tingle common to most liniments but the relief lasts for hours. It’s labeled for equine use but I know many people (some even non-horsey!) who swear by this for personal use. I haven’t experienced an increased craving for carrots or rolling in the mud while using, so I’m not too worried. 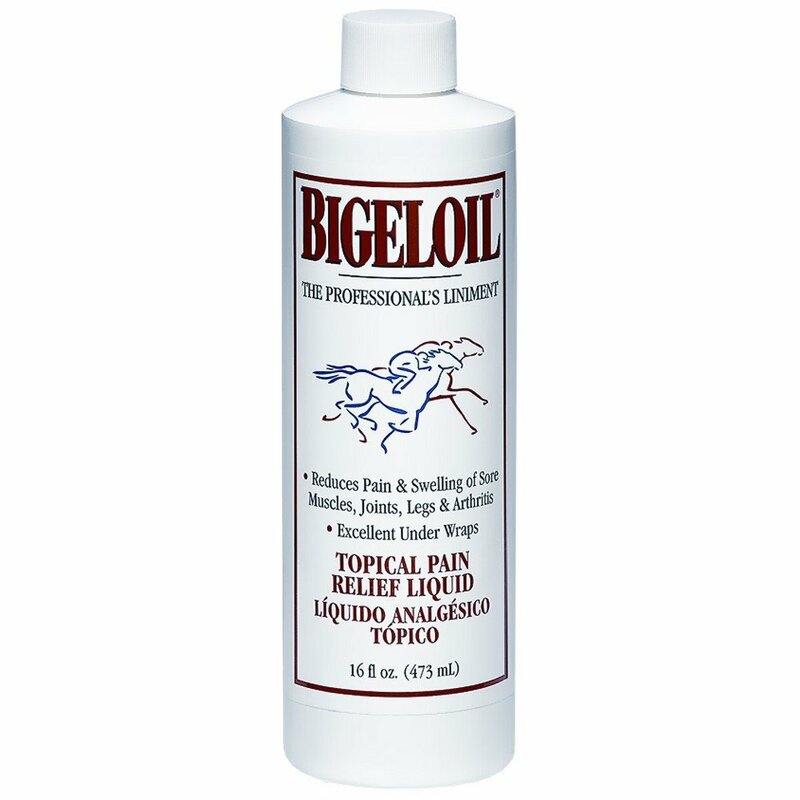 BigelOil — I think this is made by Absorbine, but it seems to be supercharged so I pick it over regular Absorbine — which is pretty good, too. 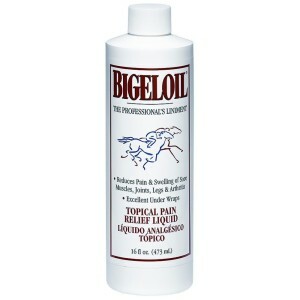 BigelOil gives a great tingle and loosens everything up in my hand, and the relief lasts long after the initial heat subsides. 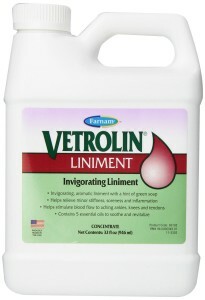 Vetrolin — This is everyone’s go-to brace at barns where I ride and I think it does the trick at a lower price than my top two. Undiluted it provides a great tingle, heat, and loosening in my hand. Plus I’ve used it diluted as an allover brace for myself after a fall. I think it really minimizes the body soreness that follows a hard jolt. Oddly enough, after trying some pretty unknown names (and knowing they would be the ultimate fix – not! ), these common brands are my go-to faves. To be fair, I’ve run into few that were real losers. But I’m convinced that they all do basically the same thing, a few just do it better than others at a better price. Plus the big brands seem to keep up with the restricted substances lists too, so you don’t get surprised at a big show.